B24 Professional Shredder uses Energy Management and Control System to reduce energy consumption by 90 percent. Cross-cut shredder automatically switches to energy-saving mode in 2 minutes after last use and switches off entirely if not used for 4 hours. Temporary mode is designed for small shredding jobs, and permanent mode is designed for large shredding jobs. Security level 3 setting shreds up to 19 sheets at a time into 3/16" x 1-1/8" pieces. Security level 4 setting shreds up to 13 sheets at a time into 1/16" x 9/16" pieces. Cutting speed is 13' per minute. Cutting rollers are made of specially hardened steel. Shredder has a 9-2/5" throat opening, shred-bin level indicator, level indicator, removable waste container, folding safety element and continuous motor operation. Waste bin holds up to 7.8 gallons. 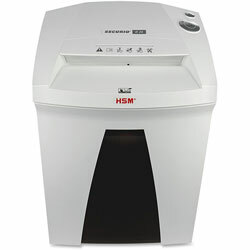 Beige Commercial Cross-Confetti Cut Shredders from HSM of America LLC! 19 In Stock today.